Rotarians Ron Aitken, Grant Barton, Pierre Chateauvert, Doug Fread and Linda Schuyler participated in a joint literacy activity with the Library's Summer Reading Program at Sparling Bush on Aug 10th. We were pleasantly surprised to see AG Dianne Yundt participating in our "Let's Explore Sparling Bush". We had 21 children aged 5-12, a number of parents and grandparents and several Rotarians who joined us in our exploration of the Bush. Ron gave an excellent introduction to the benefits of trees. 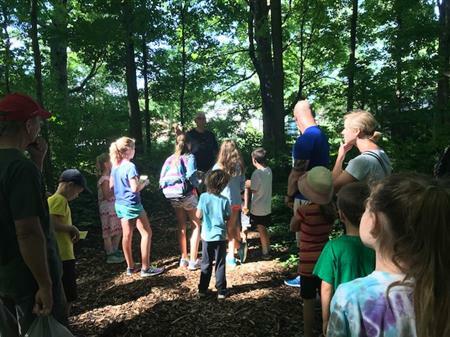 He led a walk through the bush, identifying different types of trees and vegetation and pointed out locations of hard to see Cooper's hawk nest, a tree with hundreds of woodpecker holes and invasive plants. Ron asked questions of the students. The one that I liked the best - "what do trees and people have in common" - the children gave some amazing answers. The children enjoyed bark or leaf rubbing led by Christina Donati (Library Summer Reading Program). 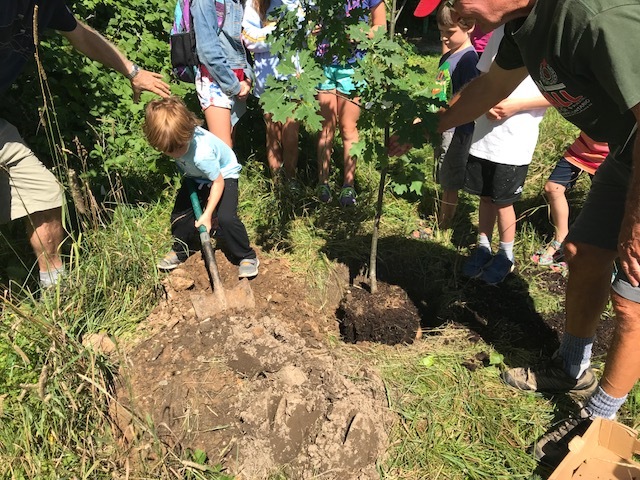 To mark the occasion, the Rotarians had purchased a red oak tree for the children to plant. The children helped return the dirt to the hole by the shovel and later with their hands. 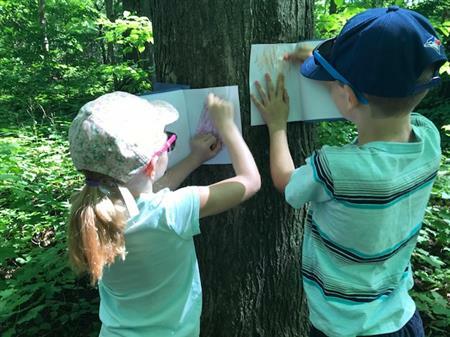 A booklet which included pictures of trees, their bark, nuts, fruit, and leaves that can be found in Sparling Bush. There were pictures and info about birds and animals that also live in the woods. 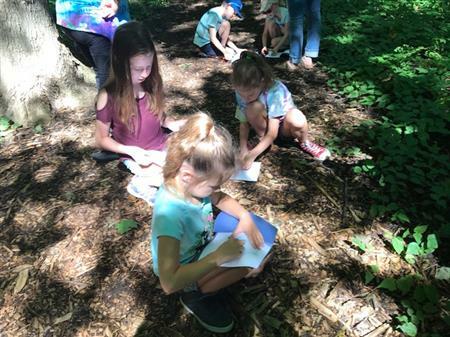 We also included pictures of bird and animal nests, garter snake skin that had been shed and woodpecker holes in trees giving evidence that creatures are in the woods. 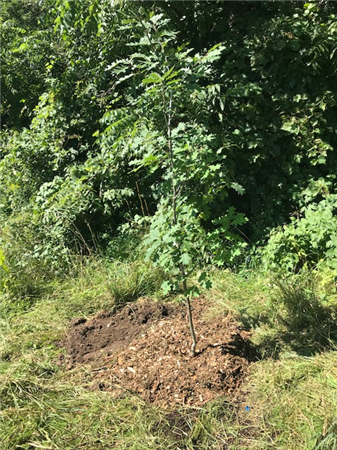 To conclude the booklet, there are pictures and info about the red oak that we planted with the children. We were blessed with great weather and an excellent group of well-behaved children. I think everyone had a great time.